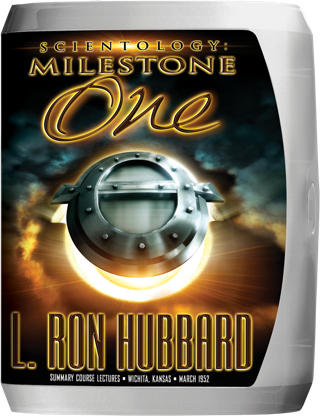 L. Ron Hubbard began the first lecture in this series with six words that would change the world forever: “This is a course in Scientology.” From there, he not only described the vast scope of this, a then brand-new subject, he also detailed his discoveries on past lives. He proceeded from there to the description of the first E-Meter and its initial use in uncovering the theta line (the entire track of a thetan’s existence), as entirely distinct from the genetic body line (the time track of bodies and their physical evolution), shattering the “one-life” lie and revealing the whole track of spiritual existence. Here, then, is the very genesis of Scientology. By early 1952, Mr. Hubbard’s investigations had led him to an altogether new view of human history. This trail of discovery began in the summer following the release of Dianetics, sparked by auditors’ reports that preclears were contacting incidents which could only be explained in terms of past lives. Through the ensuing twenty months, L. Ron Hubbard carefully investigated those unknowns, corroborating his own research findings with information supplied by auditors in the field. Of paramount importance in this investigation was the development and use of the first E-Meter, enabling him to uncover and map long-hidden incidents and, in turn, leading to the startling discovery that life force, or theta, had its own time track, independent of a body and extending back millions of years. Moreover, as he also discovered, certain incidents on this theta line were common to all cases. Thus began the first course ever given on this brand-new subject. And, in the more than twenty lectures that comprise this series, he not only described Scientology, its vast scope and where it was headed, he detailed whole track discoveries, exploring in depth one particular incident common to all beings—an incident diabolical enough to extinguish OT abilities and degrade a race of powerful thetans. He called it Facsimile One. Here, then, is the genesis of Scientology and, with it, the means to give Man an unshakable certainty of his own true spiritual nature.